We all know there’s nothing small about being a parent, and these days we’re faced with more decisions than ever. Happy Green Baby hopes to make it easier for you to discover eco-friendly options for you, your friends and your family. Happy Green Baby is an online baby boutique featuring the best in eco-friendly and sustainably produced baby clothes and baby gear. They handpick specialty organic baby and natural baby products from top quality brands, all with a commitment to lessening impact on the environment. I generously received the Naturepedic No-Compromise Waterproof Crib Pad. It is lightweight and highly versatile. It should be placed under the sheet and is easy to change and pack when traveling. It provides an excellent alternative to vinyl and latex rubber. It is waterproof, soft and breathable. It provides a soft, non-sweaty and comfortable waterproof barrier (as compared to vinyl and rubber). It also blocks dust-mites and other allergens. It is made from 100% Organic Cotton Fabric - Top and Bottom Layers with an Ultra-Thin Waterproof Membrane In Center. Features DrySleep™ technology, which effectively blocks liquids from passing through while still allowing the fabric to “breathe.” Some water vapor is allowed to escape resulting in less “sweaty backs” and a drier, more comfortable sleep. It provides an excellent alternative to vinyl and latex rubber. Naturepedic is one of my favorite brands of natural and organic bedding companies because they only use organic materials and their bedding has always been quality made and safe for my children! I have been wanting their waterproof crib pad for awhile now because it is a safe, natural and organic pad without the harmful vinyl/PVC, phthalates or latex that come from other mainstream waterproof pads. Plus, it is waterproof which is so important during the potty training stage and also for any leakage with babies! I LOVE the size of this crib pad. It is not only great for my daughter's crib but also great for using in my son's twin bed to save his mattress from any accidents. I also love how lightweight, soft and flexible this pad is and it is great for folding up and packing for trips! I also love that this pad blocks dust mites and other allergens so I don't have to worry about those bothering my son while he sleeps! Best of all, the mattress pad is made from only organic materials and that makes me the most reassured of all! 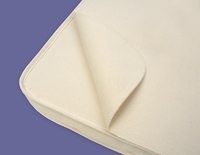 If you are looking for a safe, natural and organic mattress pad for your child's or baby's bed, you shouldn't look any further than Naturepedic and their great Waterproof Crib Pad! While you are checking it out on the Happy Green Baby website, make sure to check out their amazing selection of green, organic and natural baby products! I LOVE their selection!! Buy It: You can purchase the Naturepedic Waterproof Crib Pad for $49.00 on the Happy Green Baby website. Win It: Happy Green Baby is generously offering (1) $20 gift certificate to a lucky winner!